When I introduced my Pantry Staples series, I joked about rice and beans being so much more than just “dumping plain white rice and canned black beans into a bowl and calling it dinner.” Cough. Well. Um. I can’t lie – what I’m about to share with you is really little more than that. But hear me out; I promise it’s justified. It’s justified because sometimes you just can’t find it in you to do much more than heat up canned foods. Sometimes the thought of breaking out a knife and chopping veggies is just too much to handle. Maybe you worked late and came home and are really hungry and also exhausted and you have a headache and it’s already seven thirty and you’re angry and tired. Maybe you had a really exhausting day of truly back-breaking labor. Or maybe you’re just lazy. That’s okay. I won’t judge. It happens to the best of us. Whatever your reasons, here’s one way to use little more than pantry staples to create an easy, tasty, and filling dinner. An uninspiring photo, I know. In all honesty, this is really your basic burrito bowl… on a plate. 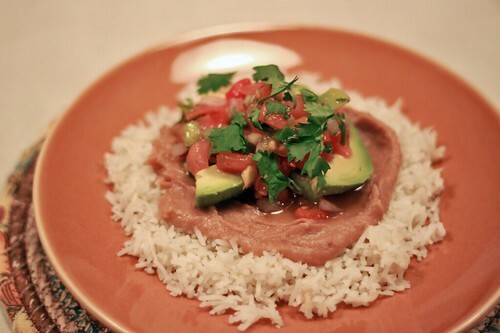 It’s just rice, canned refried beans (go for the low-sodium option! ), store-bought pico de gallo, fresh cilantro, and sliced avocado. It’s simple, easy, and tasty. It’s not gourmet, but let’s get real – even those of us who could happily talk for hours about complex, multi-step meals sometimes resort to white rice and canned refried beans for dinner. And you can too. It’s okay. Avocado makes anything 35% more delicious (it’s Science! ), and pico de gallo adds a pleasant, cool freshness to an otherwise warm meal. A note on rice – I am a believer in brown rice. I love its complex, nutty flavor and its elevated nutritional profile. But S and I are working through a giant Costco-sized burlap sack of white basmati rice that S had before we moved in together, so we often resort to relatively quick-cooking white rice for dinner. You do what you can. Because, really, that’s what being vegan is all about – doing what you can. We know that we can’t save every single animal, but by eschewing animal products and pushing corporations to provide us with cruelty-free options, we do make a difference and we do save some animals. And some is a better amount than none. So do what you can, and when you can’t, don’t worry about it. Don’t try to craft three-layer vegan lasagnas with homemade tofu ricotta and pine nut crema for every single meal. Instead, when you’re feeling beat, enjoy a lazy meal while watching 30 Rock on Netflix and cuddling with your loved ones. You’ll be happier for it. I promise. What’s your lazy meal of choice? ← Recipe Showdown: Pumpkin Cinnamon Rolls!